5 Questions for…Jeremy Walston, M.D. Jeremy Walston, M.D. is a professor of medicine in the Division of Geriatric Medicine and Gerontology at the Johns Hopkins University School of Medicine, and core faculty member in the Center of Aging and Health. He is also Co-Director at the Biology of Frailty Program and Co-Principal Investigator at the Older American Independence Center. Q: You and your colleagues have been conducting research on frailty for about 20 years; what if anything has surprised you about the results? A: Over the past 10 years, there has been an incredible increase in the amount of interest related to frailty, its definitions, and its underlying biological causes. Although we knew from the beginning that better defining and understanding the basis of frailty was key to providing better patient care, we have been surprised by the marked increase in interest by clinicians and researchers alike. We also continued to be surprised at one out of six older adults not in a nursing home is frail, and therefore at high risk of adverse health outcomes and early mortality. The fact that many surgeons and medical sub-specialists have developed a strong interest in frailty is also surprising yet very encouraging for those of us in the frailty research field. Their engagement will foster the development of new treatment modalities that promise improved care in this vulnerable subset of older adults. 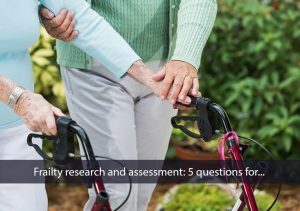 Q: Why is it important for clinicians to assess the frailty status of their patients? A: Knowing a patient’s frailty status can help to identify those older adults at highest risk for complications related to procedures and medications and longer hospital stays. Knowing frailty status will bring additional awareness of the frail patient’s vulnerability, which will alert health care providers and families to be especially cautious when managing the health care of frail older adults. Q: Which clinicians are most likely to assess the frailty status of their patients and, by so doing, get the most benefit for improving patient outcomes? A: Frailty has been become a hot topic in many medical and surgical specialties. For example, frailty assessments are used by surgeons for clinical decision making related to kidney transplantation and aortic valve replacement and by nephrologists and oncologists for determining management and treatment strategies for patients with end-stage renal disease and cancer. Frailty is also measured by geriatricians to help determine optimal management plans for older patients, especially those with multiple chronic conditions and geriatric syndromes such as mild cognitive impairment and falls. Q: Why has the application of frailty assessment to clinical practice been such a slow-moving process? A: A significant issue for clinicians has been the lack of a gold standard of measurement, and that has slowed the process of integration. For example, at Johns Hopkins, frailty is conceived as a syndrome of exhaustion, low activity, slowness, unintended weight loss, and weakness that results from multiple physiologic declines. Other researchers have characterized frailty as more of a collection of disabilities and health care conditions that in sum add up to another type of frailty. Consensus efforts in recent years have helped but definitional challenges still exist. We continue to advocate for the study of the clinical utility of frailty and for studies that help to determine whether or not frail individuals should be treated or managed differently in clinical practice. Q: The Johns Hopkins Frailty Assessment Calculator was developed to be the gold standard of measurement; how does it work? A: We wanted to develop a tool that would be easy to use, with every measurement being exactly alike. And we wanted the result of the assessment to be easily understood. The calculation is based on five criteria that are core to the syndrome of frailty: exhaustion, low activity, slowness, unintended weight loss, and weakness. And once the required data are entered in the web-based tool, the calculator generates the patient’s score: non-frail (0 criteria met), pre-frail (1-2 criteria met), or frail (3-5 criteria met). Now, our tool is one of the most commonly utilized and cited tools available for researchers and clinicians. Click here to learn more about the Frailty Assessment Calculator, or to purchase or access the free trial, click here.